Upright Brewing founder Alex Ganum—also co-owner of Grain & Gristle—isn't always sure what chef Greg Harrison Smith will do with the odds and ends he brings from his production facility—a bag of hops here, a container of wort there—but chances are good they'll end up subtly woven into an experimental dish like oysters on the half shell with beer foam or a hop-infused creme "brew"-lee. There's an ever-expanding list of ideas that blend brewing adjuncts, byproducts and beer in various stages of readiness with food in Smith's mind. It's that imaginative approach that makes this one of the best taverns in town you're probably not visiting nearly often enough. The barnlike wood-grained pub has always flown under the radar as a modest sister to Old Salt, which doubled as a butcher shop before shuttering earlier in 2018. But that has started to change as Upright enthusiasts discover Grain & Gristle has become a de facto outpost for the brewery. The added bonus is food that reflects Smith's self-effacing inclinations along with a frenetic and genuine enthusiasm for his craft—putting quality ingredients on a plate that will fill people up and make them happy. Old Salt may be gone, but its integral parts—the ranchers and butchers who helped supply the kitchen with farm-to-table cuts—are still involved at Grain & Gristle. The beef kielbasa, grilled for a slight, sweet char that nudges back against a gentle spice, is cut in three and pinwheeled over hearty chunks of potato and drizzled with tangy mustard. All of that rests on a fermented flapjack of sauerkraut. And a smoked pork shoulder pulls apart so easily, the texture is reminiscent of a pot roast that's been in the slow cooker the better part of a day. You'll probably have to ask which menu items are Smith's creations that include Upright beer, but one mainstay is the Fressen pretzel with a thick glob of pub cheese made with Engelberg Pilsener. Its sassy character might just surprise you—the heat of the spicy dijon and Mama Lil's peppers hit first, followed by a mellowing cream cheese. The bitterness of the garlic is mirrored in the beer. Just this one dip is an artfully arranged balance of acid and fat that you don't think twice about, which is why I'm glad Smith has visions of clever combinations that just seem to keep growing. 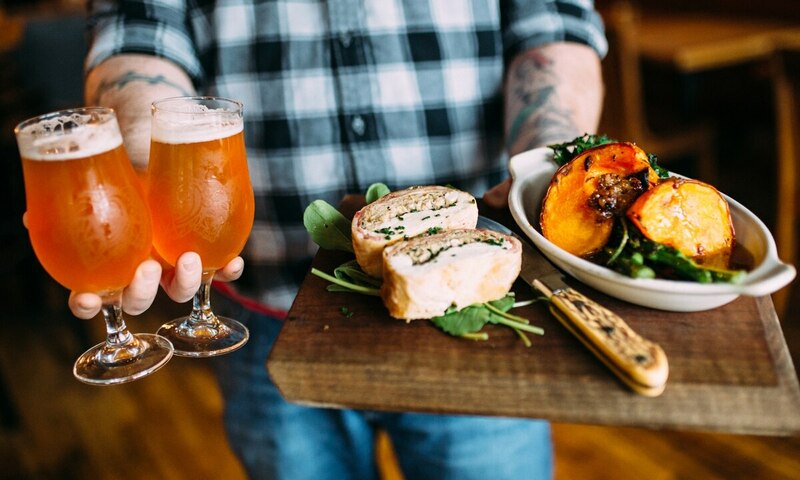 Pro tip: Get a full meal for two along with two 12-ounce beers for just $30. The selections rotate, so call after 2 pm to find out what's cooking that day. Also consider making it an early dinner since the twofer can sell out.